Public attitudes about both racial issues and immigration have changed in recent years. The share of Americans who say racial discrimination is the main reason that many blacks are unable to get ahead is now at its highest level dating back more than two decades. Still, somewhat more say blacks who are unable to get ahead are mainly responsible for their condition. An increasing share of Americans say immigrants strengthen the country because of their hard work and talents, rather than burden the country by taking jobs and health care. Most of the change in opinions on both sets of issues has come among Democrats, who increasingly take liberal positions on race and immigration. By contrast, Republicans’ views have changed little in recent years. As a result, partisan divides have widened considerably. Overall, 61% of Americans say the country needs to continue making changes to give blacks equal rights with whites, compared with 35% who say the country has made the changes needed to give blacks equal rights with whites. There are stark partisan and ideological divisions in these opinions. Core Conservatives stand out for their belief that the country has made the necessary changes to give blacks equal rights (81%). Majorities of Country First Conservatives (66%) and Market Skeptic Republicans (61%) share this view. However, New Era Enterprisers – who are less solidly Republican, younger and more ethnically diverse than the other right-leaning groups – are less likely to say the nation has made needed changes on race. About half of New Era Enterprisers (48%) say the country has made necessary changes to give blacks equal rights with whites, while nearly as many (43%) say more changes are needed. With the exception of the Opportunity Democrats, the groups on the political left broadly express the view that the U.S. needs to continue making changes in order to give blacks equal rights with whites. A clear majority (67%) of Opportunity Democrats also support this idea, but nearly a third (31%) say that the country has made the necessary changes, setting them apart from the other Democratic-leaning groups. There is a similar pattern in views of whether racism is a major problem in the U.S. Majorities of all four Democratic-leaning typology groups say racism is a “big problem” in society. Substantially smaller shares of Republican-leaning groups – ranging from 26% of Core Conservatives to 45% of Market Skeptic Republicans – view racism as a major problem. 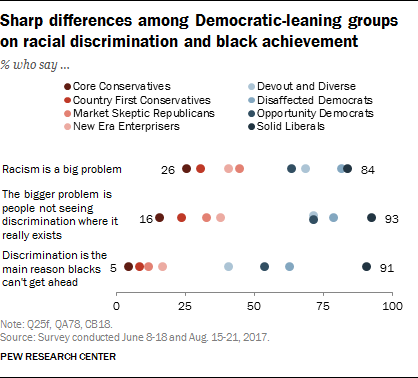 However, Democratic groups are more deeply divided on whether racial discrimination is the main reason many blacks are unable to get ahead. Among Solid Liberals – who include larger shares of white non-Hispanics and college graduates than other Democratic-leaning groups – 91% say racial discrimination is the main reason many blacks cannot get ahead. That number falls to 63% among Disaffected Democrats and 54% for Opportunity Democrats. And among Devout and Diverse, a group that is 53% nonwhite, only 41% see racism as the main barrier to blacks getting ahead; 47% say blacks who are unable to get ahead are mainly responsible for their own condition. In opinions about affirmative action, 71% of Americans take a positive view of affirmative action programs “designed to increase the number of black and minority students on college campuses,” up from 63% who said this in 2014. Among the political typology groups, Core Conservatives are the only one in which a majority (57%) says affirmative action programs at colleges are a bad thing. 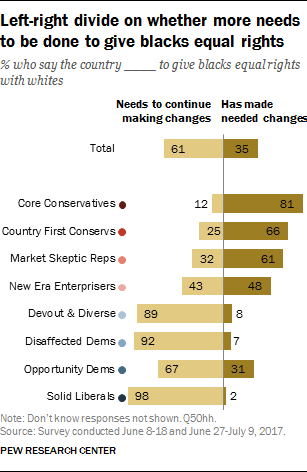 About half of Country First Conservatives and Market Skeptic Republicans say these programs are a good thing (52% and 53%, respectively), while New Era Enterprisers are more positive (67% say they are a good thing). Large majorities of every Democratic-leaning group say affirmative action programs are a good thing (74% of Devout and Diverse, 88% of Disaffected Democrats, 81% of Opportunity Democrats and 94% of Solid Liberals). The Black Lives Matter movement divides typology groups along ideological lines. Support for the Black Lives Matter movement is most widespread – and intense – among Solid Liberals. More than nine-in-ten Solid Liberals (94%) support the movement, with 65% saying they support it strongly. And opposition is strongest among Core Conservatives: 84% oppose the group, 66% strongly. Opinions about Black Lives Matter are less one-sided across other typology groups. Aside from Solid Liberals, majorities of the three other Democratic-leaning groups support Black Lives Matter – though 31% of Devout and Diverse say they oppose the movement. 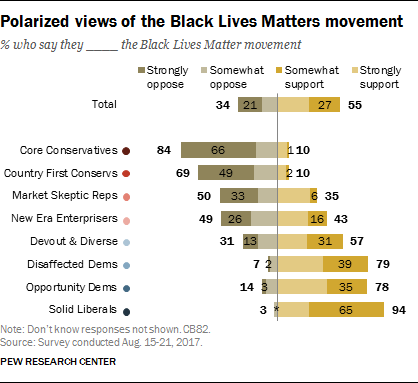 Among GOP groups, large majorities of Core Conservatives (84%) and Country First Conservatives (69%) oppose the Black Lives Matter movement; opposition is less pronounced among Market Skeptic Republicans (50% oppose) and New Era Enterprisers (49% oppose). When it comes to attitudes about immigration, Democratic-leaning groups hold almost universally positive attitudes toward immigrants and support the idea of America being open to people from all over the world. 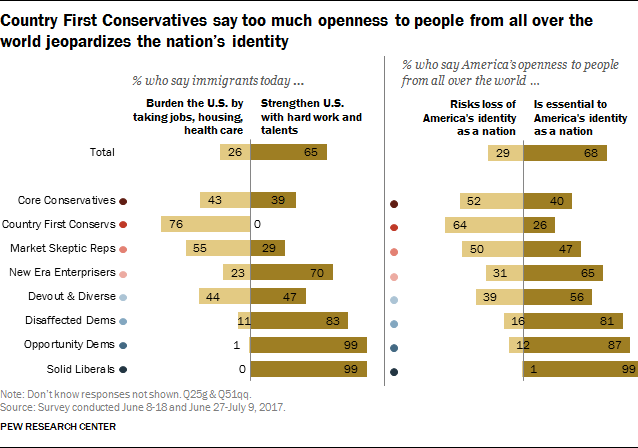 Virtually all Solid Liberals say that immigrants strengthen the society and that openness is “essential” to America’s identity as a nation (99% each). The only group on the political left that holds ambivalent views of immigrants is Devout and Diverse, a group that is racially and ethnically diverse and also has the lowest family incomes and levels of educational attainment of any typology group. The Republican-leaning groups are sharply divided in views of immigrants and the nation’s openness to people from around the world. About three-quarters of Country First Conservatives (76%) say immigrants are a burden on the country – the largest share of any typology group. Country First Conservatives also are most likely to say that the U.S. risks losing its identity as a nation if it is too open to people from around the world (64% say this). 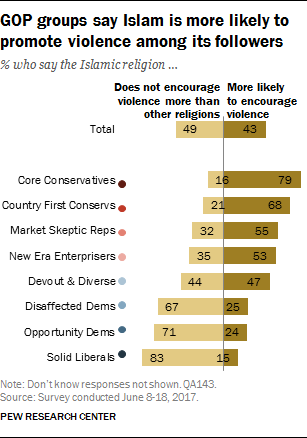 A large majority of Core Conservatives (79%) say Islam is more likely than other religions to encourage violence among its followers. And roughly the same percentage of Solid Liberals (83%) say Islam does not encourage violence more than other religions. The views of other typology groups divide along partisan lines, with one exception. As with views of immigration, Devout and Diverse differ from other Democratic-leaning groups in their views of Islam and violence. Devout and Diverse are divided – 47% say Islam is more likely to encourage violence, 44% say it is not – while sizable majorities in other Democratic groups say Islam does not encourage violence more than other religions.